Want to show a rolling average for your data, but not the granular breakdown? We can use the average window function to run this calculation. First, I created a CTE that contains the number of new users per day on a fictional gaming platform. If you want to read more on CTEs, check out our post here! Next, we run this window function to get a rolling average from the preceding 9 rows to the current row. To read more on window function, check out this post here! 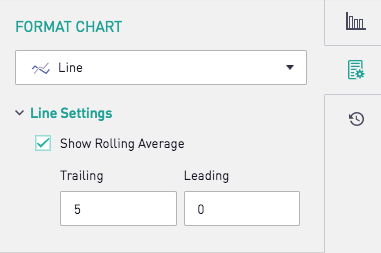 Tip: If you want to display both the raw data and the rolling average, Periscope's built-in visualizations has a quick "Show Rolling Average" check box that you can toggle on. If your version of SQL doesn't support window functions, then you can use Periscope Data's Python/R integration to run the same calculation in R (as shown here), or using Python (shown here).